Wahama head coach Dave Barr walks on the field during a break in the action, in the White Falcons’ double-overtime loss on Sept. 8, 2017, in Racine, Ohio. MASON, W.Va. — The home sideline at Bachtel Stadium will be without a familiar face next fall. 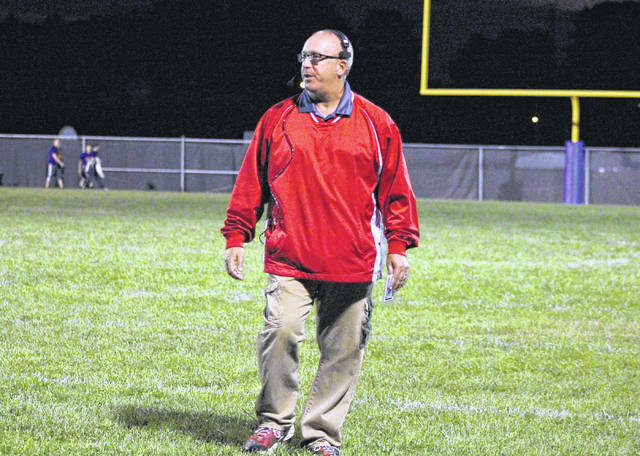 After more than a decade with the White Falcons, including the last 4½ seasons as head coach, Dave Barr resigned from his post with the Wahama football program in April. Barr — the 2017 Tri-Valley Conference Hocking Division co-Coach of the Year — is headed to the next level, as he has taken the job as defensive coordinator of the Hocking College Hawks. Barr began his coaching tenure with the White Falcons as defensive coordinator, the same position that he held when Wahama won the Class A state championship in 2012. In Week 7 of the 2013 season, Barr took over head coaching duties following the resignation of Ed Cromley. Starting with a 53-12 victory over Federal Hocking, Wahama won its first five games under Barr. The fifth game of that streak was in the opening round of the postseason, when the White Falcons defeated Clay-Battelle by a 49-27 count. The White Falcons fell to MHS by a 77-50 count in that game, and the Blue Dons went on to win the Class A title two weeks later. Barr led the Red and White into the playoffs again in the following campaign, but top-seeded St. Mary’s — the eventual Class A runner-up — knocked Wahama out in the opening round by a 40-20 final. After just six wins over the next two seasons, Wahama began the 2017 campaign with four straight setbacks. The White Falcons found their form late in the season, however, winning five of their final six contests, including a 20-19 overtime triumph at Buffalo in Week 11. Now, Barr will be joining a Hawks program under the direction of head coach Adolphus Matthews. Hocking College is a National Junior College Athletic Association school. “It’ll be a new challenge,” Barr said. “The draw in coaching is always, can you rally a group of people together to accomplish a common goal. With Hocking being a junior college, they have a whole system of bowl games. Getting to coach in a bowl game is something I have as a goal, I’d love to be able to do that. The Hawks were 4-6 last fall, with a pair of wins on their home field in Nelsonville. Hocking College had shown interest in adding Barr to the staff before the 2017 season, but the timing just wasn’t right. “It was in July and I didn’t think that it was the right time to leave,” said Barr. “It was pretty late, so I passed on it. When the season was over they approached me again, but I was getting ready to have shoulder surgery and I didn’t want to talk about it or think about it at the time. When I got through with therapy, I went and met with Coach Matthews, and by then it had turned into a coordinator’s job. I kicked it around, we met a couple times to talk things through. Barr also noted that the recruiting aspect was much better than what he expected. In addition to his coaching tenure with the White Falcons, Barr has been head football coach at Southern for six seasons, Eastern for three years, and Roane County for two, as well as Hannan and Wellston for one year apiece. Barr will remain at Wahama as a teacher and as the varsity track and field coach.